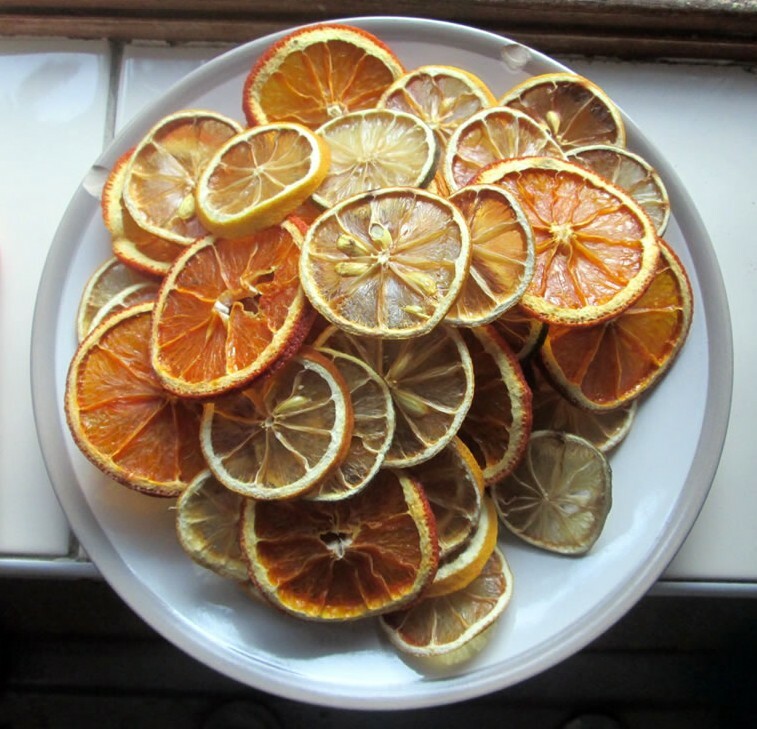 Dried citrus fruit is great for making Christmas decorations. There’s something wonderful about using natural materials for making stuff. As well as the end result looking lovely, the process is fun, they smell amazing and they don’t contribute to landfill. Providing they don’t get damp and warm (and green and furry as a result! ), they last for a few years. The dried fruit can be used to make garlands, wreaths and decorations, which is what I am planning to do with mine! The first step in the process is to dry the fruit out. 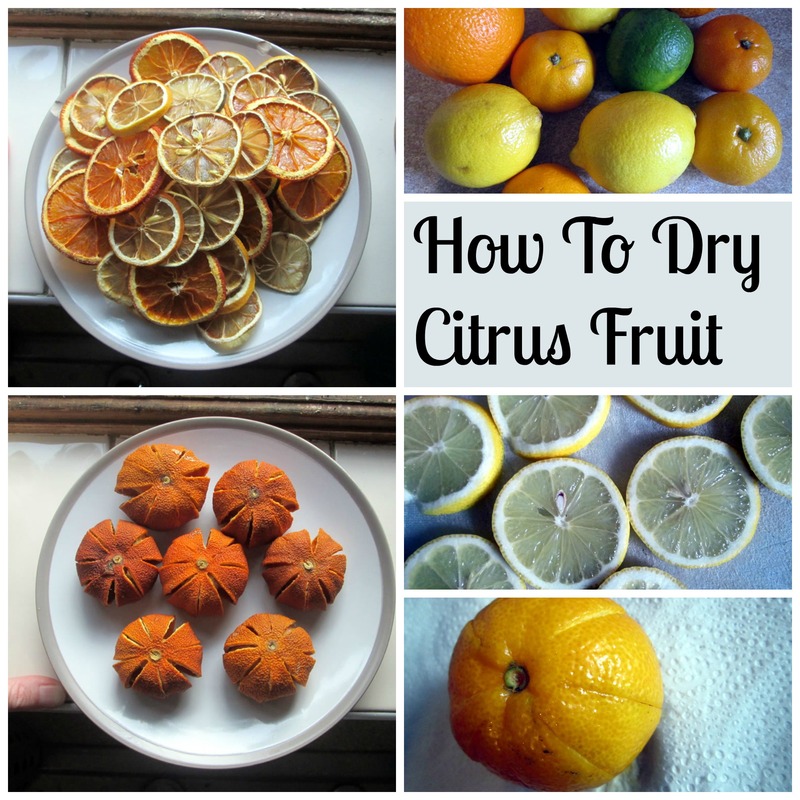 So here is how to dry citrus fruit! You will need: citrus fruit (I used oranges, lemons and limes), chopping board and sharp knife, oven on its lowest setting. 1. Start at the stalk end and cut parallel with the fruit’s equator. 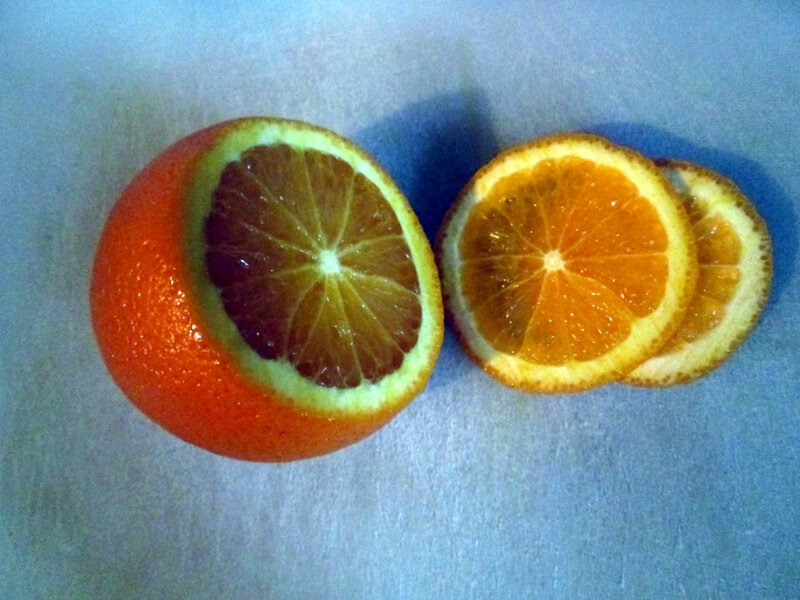 That way you will have the middle of the fruit in the middle of the slices which will make them easier for threading. 2. Slice the fruit thinly. The chunkier the slices, the longer they will take to try. Aim for a thickness of 1/2 cm max. 3. Poke a skewer or a cocktail stick through the middle of the fruit. If you forget, it doesn’t matter, it’s just easier to make the holes before the fruit has dried. 4. Put the oven on its lowest setting. 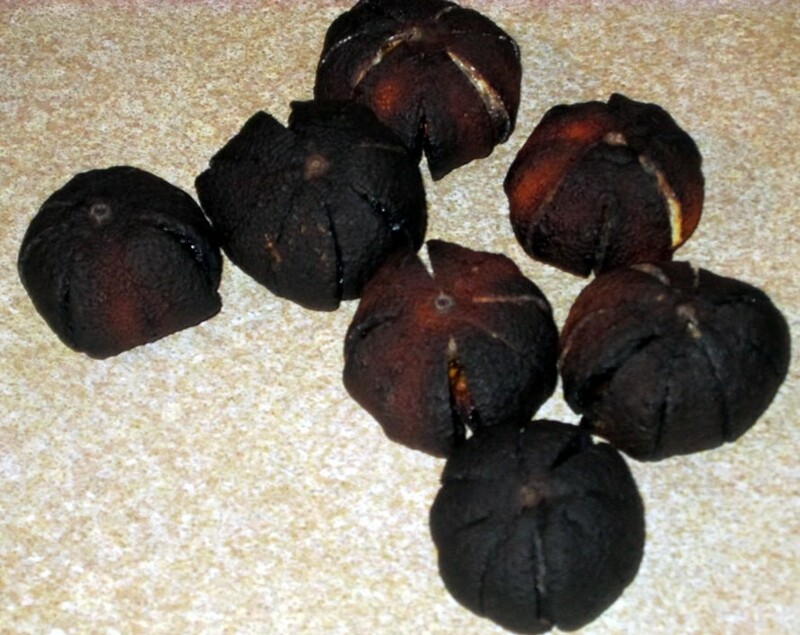 Remember you are drying the fruit out, not cooking it! Arrange the fruit slices straight onto the racks without a baking sheet. This will allow the warm air to get to both sides of the slices and they will dry quicker. 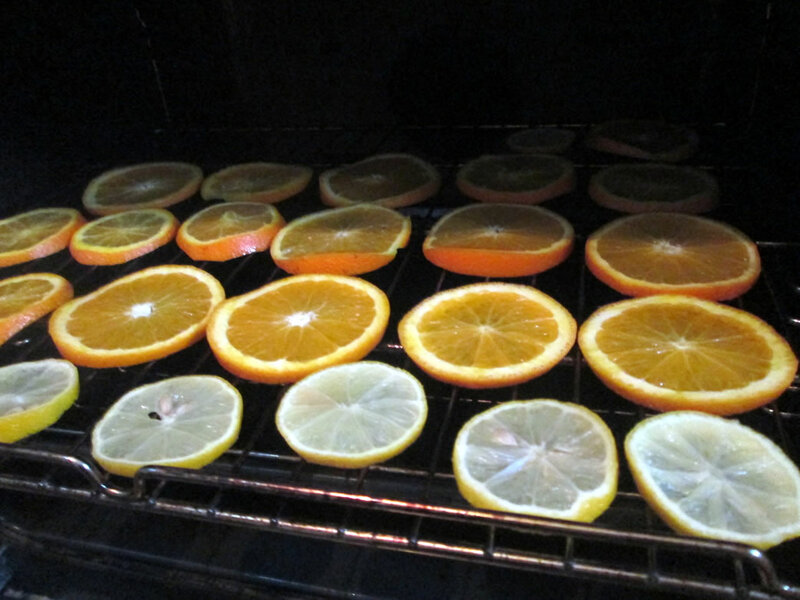 The fruit slices will take about 4 hours to dry, depending on how thick the slices are. If the fruit slices are not quite dry, they can be left out to dry in the air. A radiator or a sunny windowsill will help the process along. 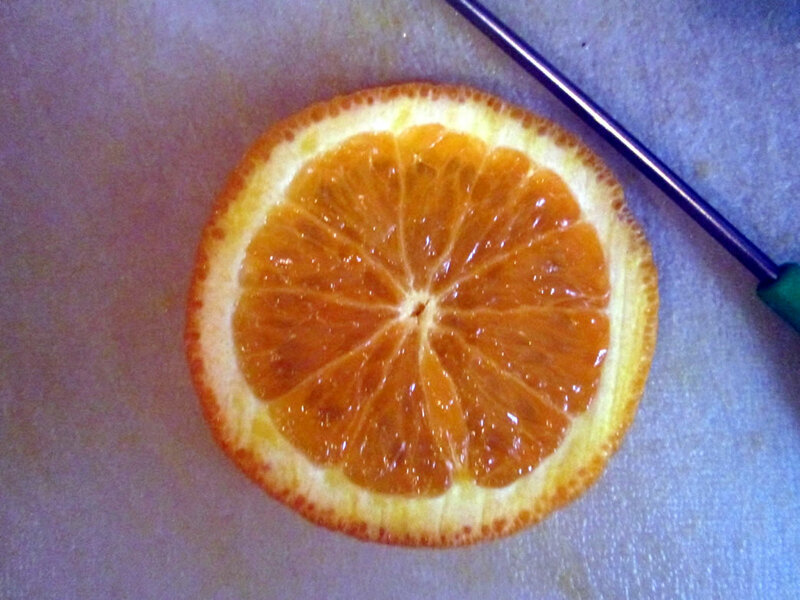 You will need: small citrus fruit (I used clementines. 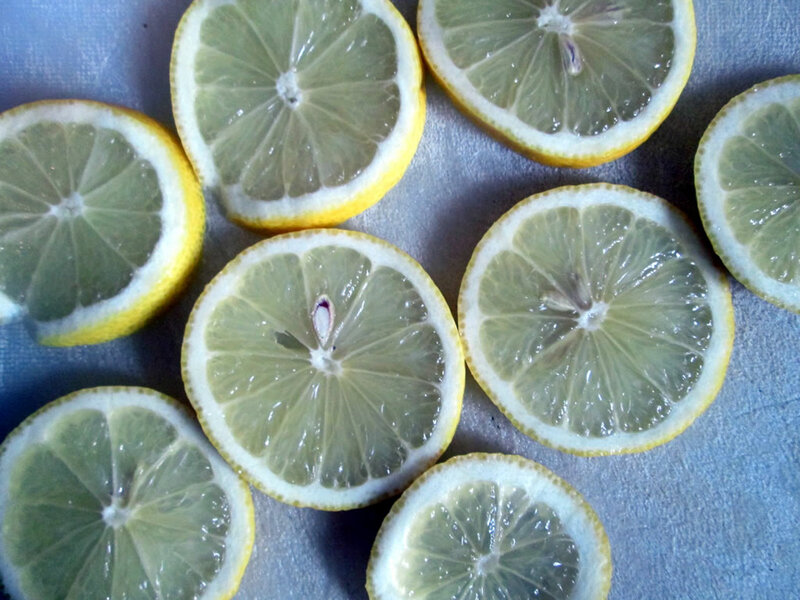 Limes and small lemons would probably also work), a sharp knife, oven on its lowest setting. 1. Make 8 cuts into the fruit, spacing them out evenly. The easiest way to do this is to cut at 12 o’clock and 6 o’clock, then 9 o’clock and 3 o’clock, then half way between each cut. 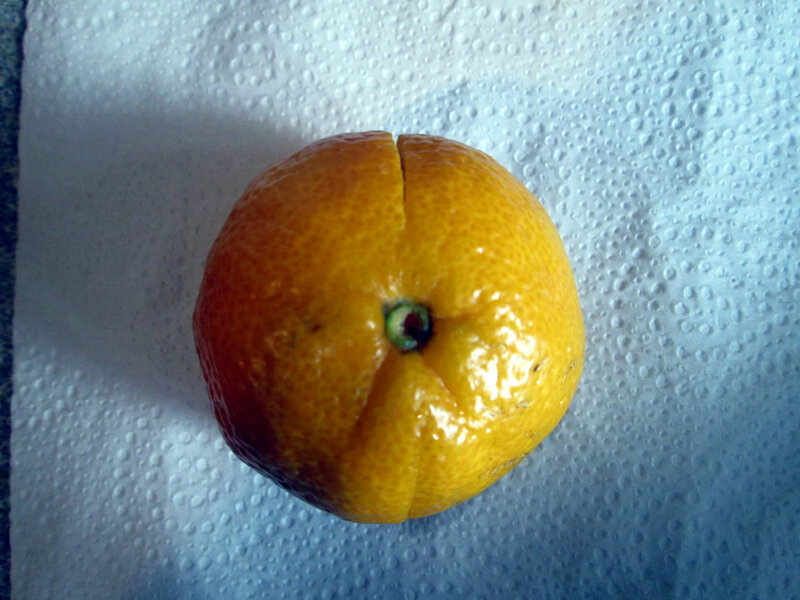 Take care to leave the skin at the top and the bottom of the fruit intact. 2. 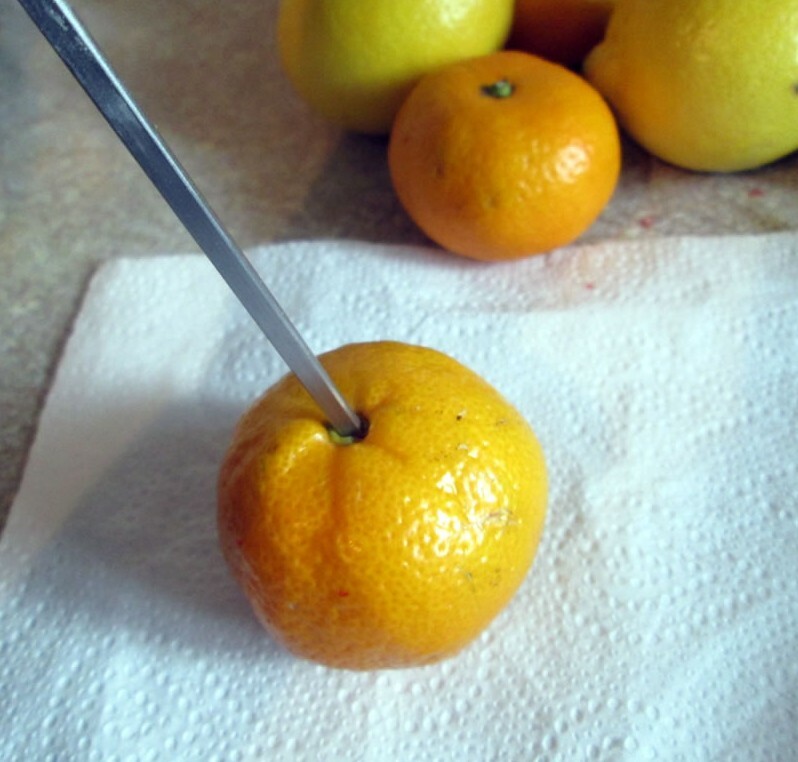 Push a skewer through the middle of the fruit. 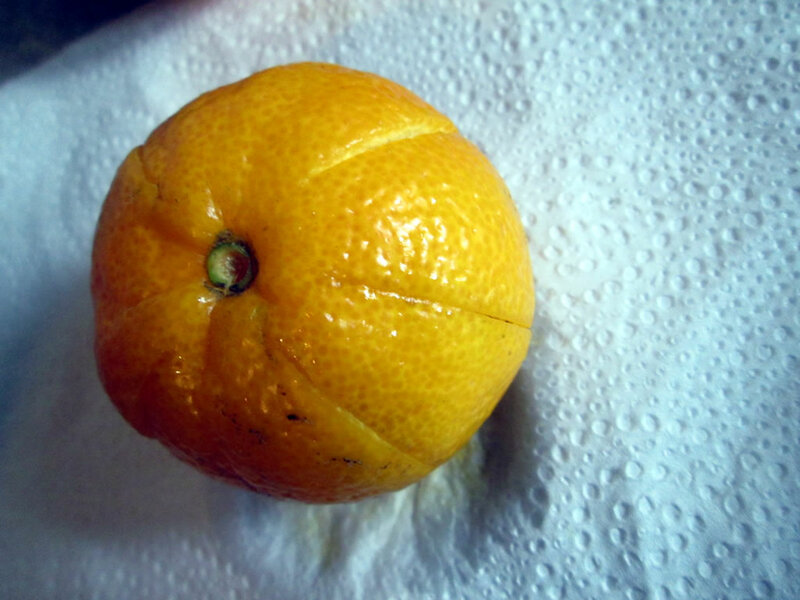 Making a hole through the fruit from top to bottom now will make it easier to thread once it has dried. 3. Put the fruit in the oven on the lowest setting. 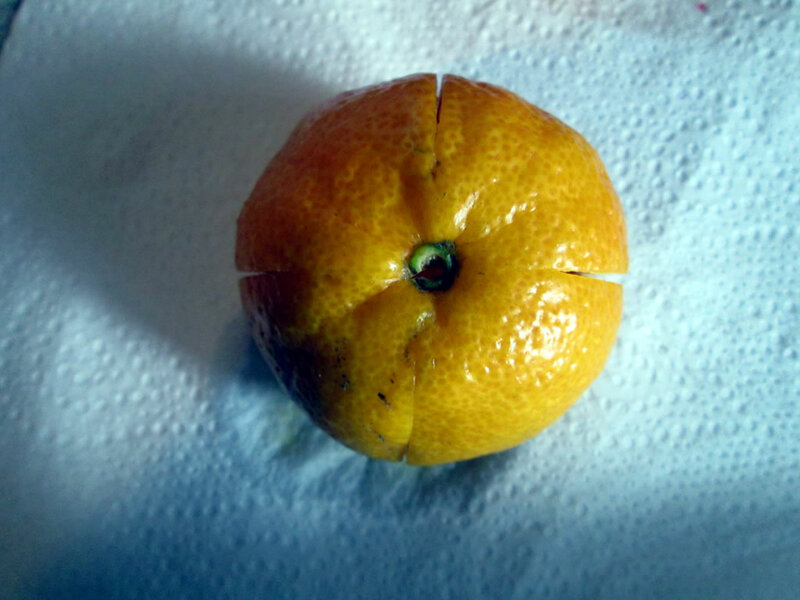 I actually had a mishap with my first batch of clementines. Husband heated up an apple and blackberry crumble in the oven on 220 C for 20 minutes. It was nice, very tasty. Unfortunately the clementines were still in there. Charred clementines were not what I was going for! So if you are tempted to whack up the temperature to speed things up, I would not recommend it! Whole fruit takes longer to dry than slices. 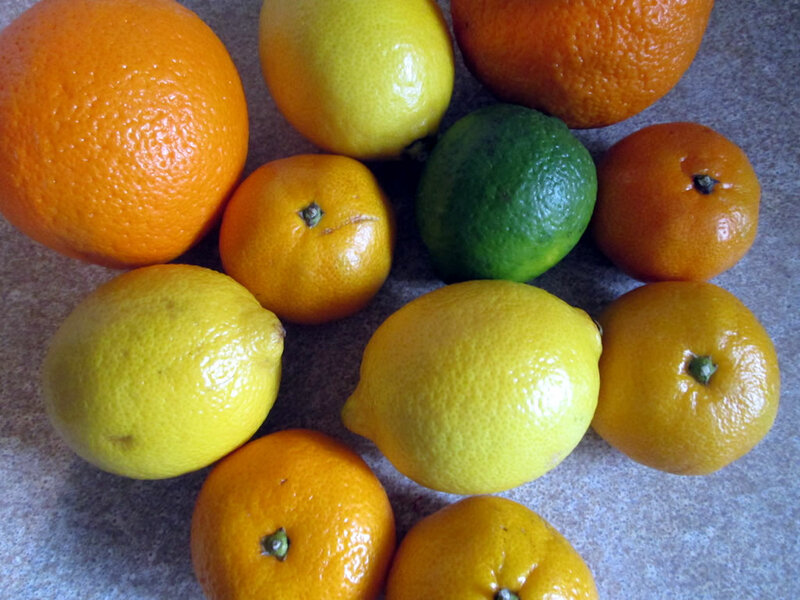 Smaller fruit like clementines and tangerines will dry quicker than oranges and grapefruit. Put a hole in the centre of the fruit before putting it in the oven. Fruit that isn’t quite dry can be left to dry in the air. Keep the oven turned down low. Turning it up will cook the fruit rather than dry it out and might burn it to a crisp. A lot of juice will come out of the fruit while it is drying and it may well end up on the kitchen floor, so putting down some pre-emptive tea towels or kitchen towel might be an idea. Once dry the fruit will keep for ages as long as it is kept dry and cool. Putting almost dry fruit in a tin next to the radiator will result in mouldy fruit, as I discovered when I did this last year! Once dry, the fruit can be used to make garlands, wreaths and other decorations. More on that another time! 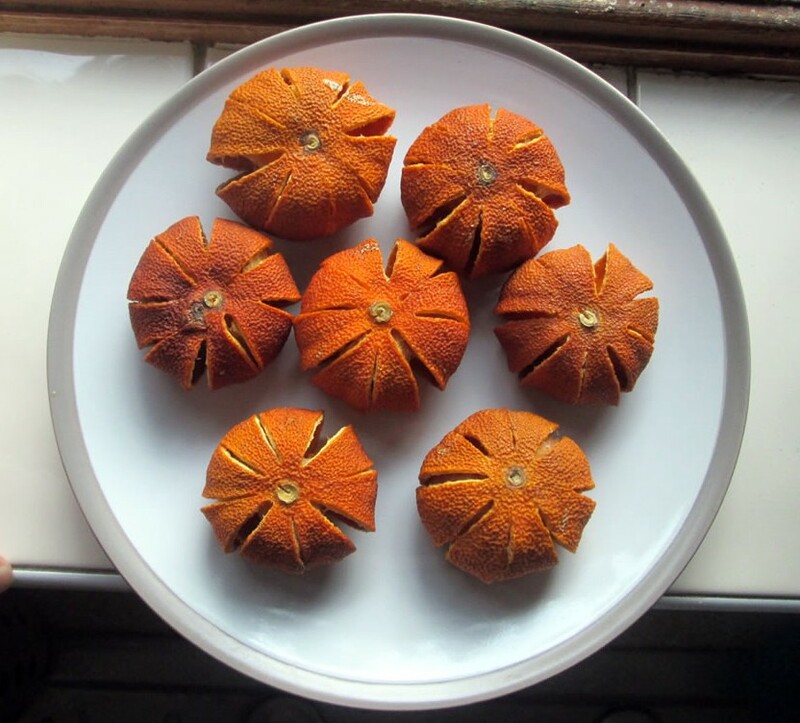 Thanks for sharing this, Anna – something totally new to me, although I did make a pomander with cloves and an orange many years before blogging. It sat in a linen cupboard, until many years later it finally crumbled. The aroma was lovely, as I imagine your dried oranges would be. Something for me to try. Thank you for posting this Anna – I just bought bags of fruit from the market with thoughts of making a wreath but with no idea how! Oven all day then airing cupboard will probably do it, as long as the whole fruits are not to big. They do take quite a lot longer than the slices. Happy Christmas crafting!